Our store is conveniently located in downtown Easton, MD at 303 North Washington Street where we have plenty of parking available every day from open to close. 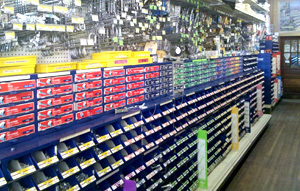 Open since 1939, we are now one of the Eastern Shore’s oldest and most widely recognized independent hardware stores. At Easton Hardware & Floor Covering you will find the most knowledgeable, personable and friendly staff found anywhere on the shore. Known by some of the locals as simply the “Old Time” hardware store, Easton Hardware & Floor Covering is still proud to be able to offer everyone who walks in our door the kind of real honest to goodness One-on-One customer service that the big box stores can never come close to. No long lines, no waiting and no hassles. Friendly, fast and always fair. Stop on in or give us a call. We are open from 7am until 5pm, Monday through Saturday. 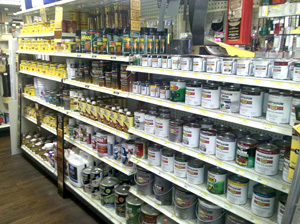 Easton Hardware & Floor Covering offers customers a lot more than just your basic nuts and bolts. We cater to the incredibly diverse needs of our thousands and thousands of local residents as well as the many visitors, who have become a vital part of this unique Eastern Shore community. 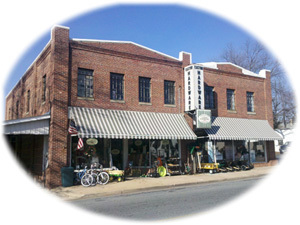 Providing a quiet and comfortable setting inside the original red brick building, the front of our store still has the original hardwood floors and aisles and aisles of fully stocked shelves where you will find a large selection of power tools, hand tools, lawn equipment, work wear and much, much more. Visit our HARDWARE page to find out more information on what you can find on our shelves and from the staff at Easton Hardware & Floor Covering. Easton Hardware & Floor Covering has been expanding its business over the years by adding a wider variety of goods and services to fit the needs of our growing community in and around Easton, MD. Along with all the new products you can now find in our “old time” hardware store, the carpet and flooring business has also grown to become a major part of our success story. We have been able to do this because of our hard earned reputation for being one of Talbot County’s most reliable and dependable sellers and installers of quality flooring products. Visit our FLOORING page to find out more information on the wide variety of choices now available in our showroom at Easton Hardware & Floor Covering. STOP IN TODAY! Easton Hardware & Floor Covering is conveniently located on 303 North Washington Street in downtown Easton, Maryland. Our reputation for giving everyone who walks in our door the very best in customer service continues to bring us new business every day from local residents, visitors and businesses who come from all over the Delmarva Peninsula including the nearby towns and communities of St. Michael’s, Oxford, Tilghman Island, Trappe & Cordova in Talbot County as well as from Kent Island, Wye Mills, Wye Oak, Denton, Chestertown, Centreville, Rock Hall, Queenstown, Grasonville, Stevensville, Cambridge, Vienna, Preston, Ridgely, Hurlock & Preston in Dorchester, Queen Annes, Caroline & Kent Counties.